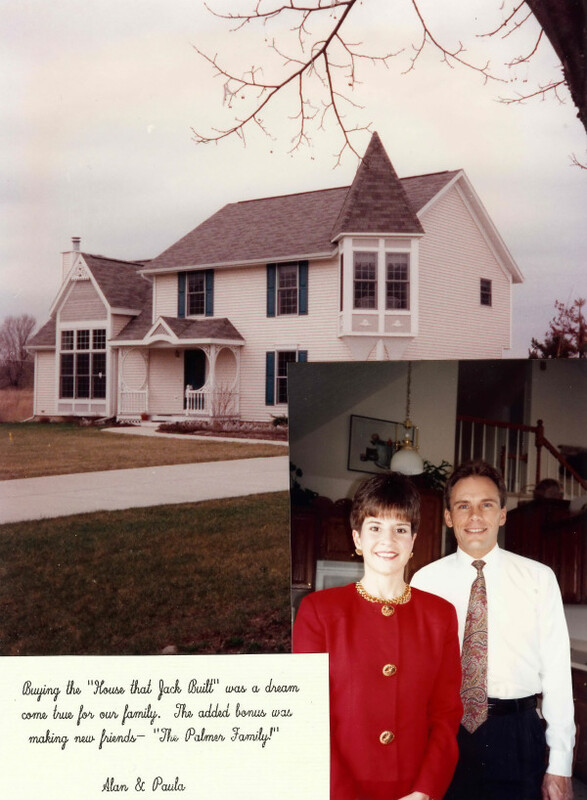 Jack Duncan Palmer Construction built our home in the center of 40 acres in DeWitt, Michigan. Mr. Palmer walked the property with us to locate the best spot for the home, he contracted with all subcontractors, picked excellent subcontractors, oversaw their work, assured excellent installation and follow-up. 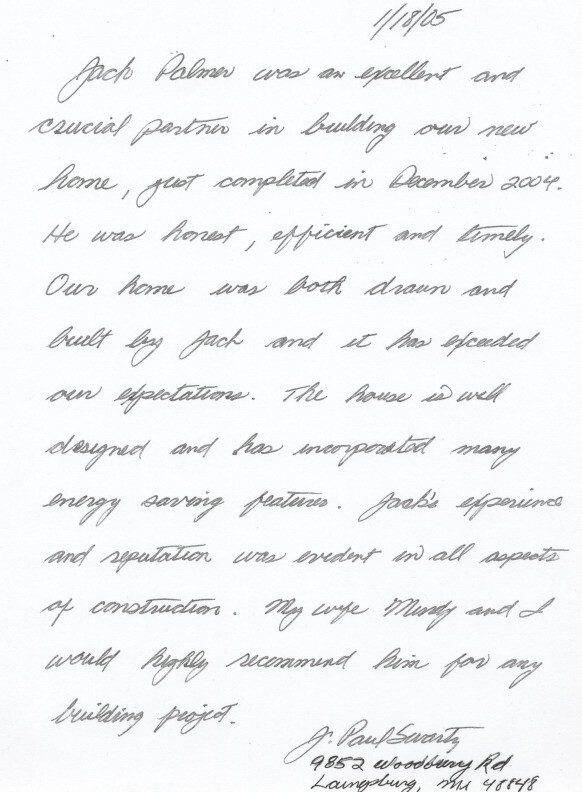 He referred us to excellent resources to pick out all the many components that go into a new home construction, and was on top of all aspects of the construction. He was extremely honest, professional, and contributed excellent insight and expertise in every aspect of the construction. He shared creative ideas and took the same amount of interest into every detail of our home as he would if he was building the home for himself. He highlighted traffic areas, lighting, and helped us think through how we would use each space so as to position the appropriate fixtures, outlets, etc. We trust Mr. Palmer’s opinions and insight a hundred percent. 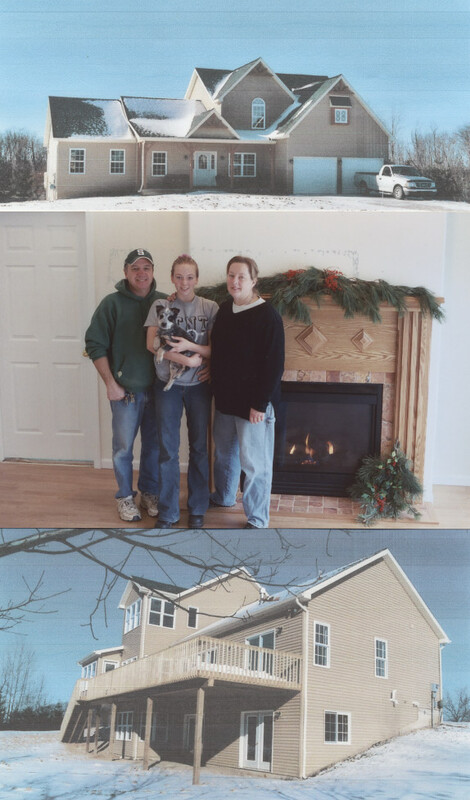 Member Comments: The overall process of building our home went exceptionally well. 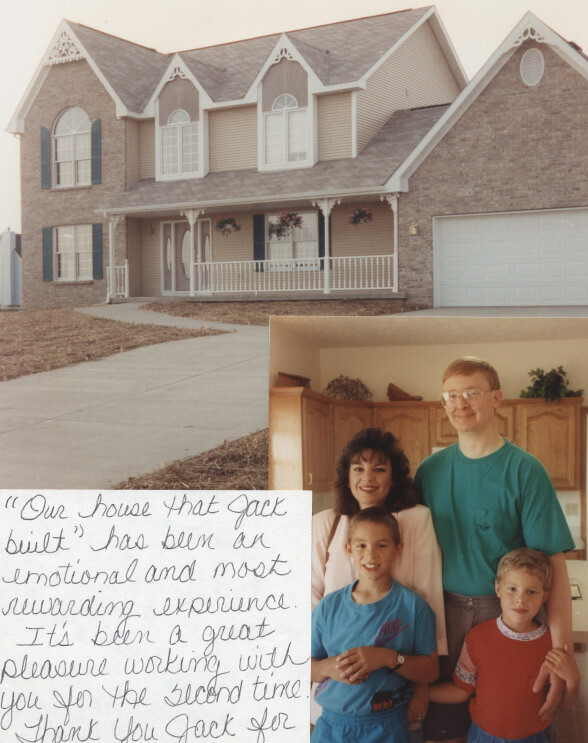 We dealt with Mr. Palmer since 1995 when he put an addition on our old home. We were so satisfied with Mr. Palmer that we never looked at different builders when we decided to build. We presented Mr. Palmer with our ideas about what we thought we wanted in a home and he worked with us to developed our ideas into a beautiful home. He brought his expertise to the development of the land and lay-out. We found him to be a good steward of our financial resources, when we made decisions to make alternations to our original plan, he was most helpful to provide what we wanted. If the cost was going to put us over budget, he was always forthright in informing us and discussing other options. After our home was complete, any questions and concerns we had were addressed quickly, professionally, and without question. Even two years later, Mr. Palmer is more than helpful with any questions or concerns, as was evidenced recently when a faucet leaked. He quickly repaired it, without question. I have referred Mr. Palmer to anyone I know is looking for a builder. He builds high quality homes, with exceptional workmanship. His honesty and commitment to us has been more than we expected. He is rare in this area and I am more than happy to have had him as a builder. In the end, he has become more than a builder, but also a good friend. One of the most meaningful experiences I have had with Mr. Palmer was the day we walked the property and picked out the location of the house. Before he would break ground to put in the first stake marking the first corner, Mr. Palmer stopped, and lead us in a prayer to bless the land and the construction of our home. This gesture speaks volumes of Mr. Palmer’s character. There were two jobs, the first was an addition to the house that was completed in 1995 and more extensive restoration and rebuilding following extensive storm damage in 2007. The initial work involved excavation, some demolition and rebuilding with a brick exterior, etc. The most recent work was an extensive rebuild with some concurrent remodeling. Because there was extensive storm damage the work included demolition and removal/cleanup of heavy debris before the rebuilding could begin. The project included new roof trusses, brick work and exterior siding, insulation, drywall, painting, electrical, plumbing, flooring, windows and finish work. Member Comments: They were responsive and prompt, on the site the morning after the storm with clean up restoration beginning the following day. They did most of the work but provided general contracting services and sub-contractor oversight for the electrical, plumbing, etc. They were efficient, kept us informed of decisions that we would need to make in the near future, recommended reliable sources for flooring and other materials and kept the project on schedule. They required sub-contractors to come back if the quality of the work was not exactly as it should have been. The job was completed within the time indicated, within budget and the craftmanship was excellent. They did the construction for an addition. Member Comments: They are excellent. Their attention to detail and the ease of collaboration were outstanding. Their customer services was fantastic and they were very fair with keeping prices under control. We couldn’t be happier with their work. I would highly recommend them.